Hello and welcome to today’s short and sweet #5aday and my last post until Thursday 21st March. It’s #SundayTimes and I’m currently writing this while chilling, after a day’s skiing in Verbier, Switzerland. My #5aday today is made up of the key highlights of this week’s holiday. 1. Rest and Relaxation – I’ve had a very busy past month back in London, and the mountain surroundings are the perfect environment to blow the cobwebs away. 2. Catching up with family – I’m staying with my brother until Thursday and get to spend some valuable time with my two beautiful nieces, who I haven’t seen since Christmas. 3. 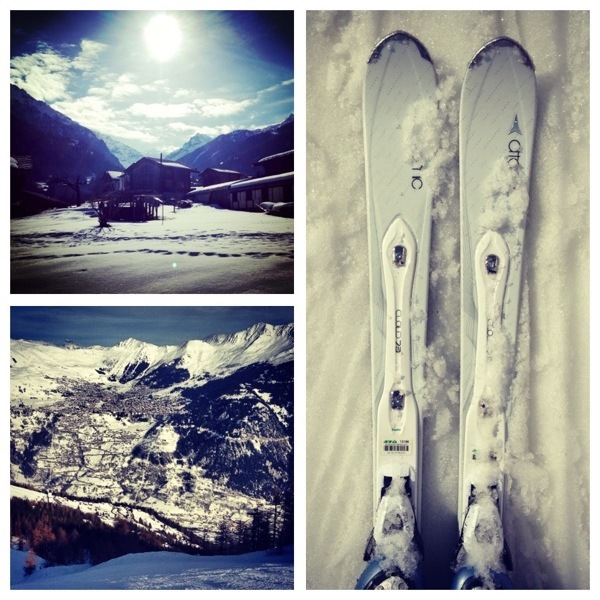 Skiing – Obviously this is high up the agenda although the conditions today lend themselves more to après than ski! On Thursday I then move to Crans Montana for the City Ski Championship and somehow I’ve managed to get roped into a dual and giant slalom race on Friday. Help! 4. Après-Ski – Clearly this is also on the agenda, especially from Thursday onwards. I might not be quite so refreshed come a week tomorrow! 5. Sunshine – Today has been a glorious day as you can see from the pics, so fingers crossed we’ll have some more sunshine but to be honest we could do with some more snow too. So that’s it… I’m taking some much needed #GTime Out from my regular #5aday. I will tweet the odd pic or two though, in an effort to make everyone back home as jealous as possible! Take care and see you back here for #GTime business as usual on Thursday 21st March. Evening! It’s #SaturdayShopping time… With London Fashion Week comes talk of A/W13 trends to watch out for but what about looking hot this winter? In preparation for skiing in a few weeks, tonight’s #5aday features gear to make you stand out on the slopes & ensure you ski in style. Gucci Goggles in Silver – With double lenses & special technology to stop fogging. Very regardez-moi @ £125. Sorel Joan of Arctic Boot – Non-slip, warm & waterproof can be stylish with these boots @ £155. Giro Sheer White Helmet – You can’t take safety lightly on the slopes, so protect yourself in this @ £159.99. The North Face Women’s Free Thinker GTX Pant – These bright yellow trousers will help you in the bumps @ £319.99. The North Face Women’s Chaletta Down Jacket – Warm, windproof, waterproof AND highly wearable in blue @ £329.99. 5 essentials to ensure you look hot while on the slopes and during apres-ski but which will slalom its way into tonight’s #GTopSpot? Tonight’s #SaturdayShopping #GTopSpot goes to #5 The North Face Women’s Chaletta Down Jacket – Stay warm & look cool.